Be the first to share your favorite memory, photo or story of Garry. This memorial page is dedicated for family, friends and future generations to celebrate the life of their loved one. It is with much sadness that we announce the passing of Garry Dale Schaal. Garry was born in Eastend, Saskatchewan to Walter and Lillian Schaal. The family relocated to the Red Deer Lake area in 1949 where Garry ranched until moving to Seasons Retirement Home in High River. Garry is survived by his wife of almost 50 years, Linda; his son Randy, daughter in law Lisa, very special grandson Walter; daughter Suzon; sister Beverley (Jack) Macklin and their family. 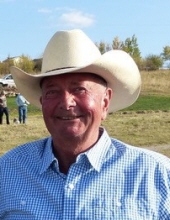 Garry was a hardworking, passionate rancher with a love for animals and kids. He was a man of few words but cherished visits with friends to discuss weather, farming, cattle, horses and rodeo. If a friend or neighbour was in need Garry would be there. The family invites friends and relatives to join them for A Celebration of Garry’s Life at the family farm Friday, February 15, 2019. Please drop by between 1-4 pm. Memories and/or stories of times with Garry will be welcomed for his memory board. Please wear warm farm attire. To send flowers or a remembrance gift to the family of Garry Dale Schaal (Red Deer Lake), please visit our Tribute Store. If desired, memorial donations may be made in Garry's memory to STARS Air Ambulance. "Email Address" would like to share the life celebration of Garry Dale Schaal (Red Deer Lake). Click on the "link" to go to share a favorite memory or leave a condolence message for the family.